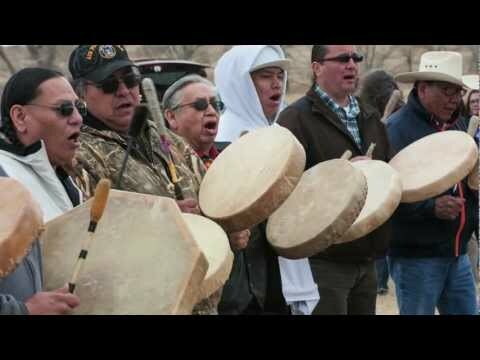 On a warm and breezy Earth Day on the prairies of the Fort Peck Indian Reservation in northeastern Montana, a wondrous event occurred. A bison calf was born. Why is this baby bison so special? He is the first calf born to the genetically pure Yellowstone National Park bison herd that was successfully transferred to tribal lands last month. This amazing little bison was welcomed into the world surrounded and protected by 61 members of his extended family. A longtime friend of mine and NWF, Jonny Bearcub Stiffarm, who works for Native Energy and is an enrolled Fort Peck Tribal member, was at the bison pasture with her grandkids and was witness to the birth. This mom and the rest of the herd endured a 500-mile trek from a quarantine facility outside of Yellowstone National Park to the bison pastures at Fort Peck. The tribes, NWF, and other groups have worked for years to relocate wild bison to tribal lands rather than see them sent to slaughter. Now, instead of seeing bison killed we have created a pathway for bison to thrive.